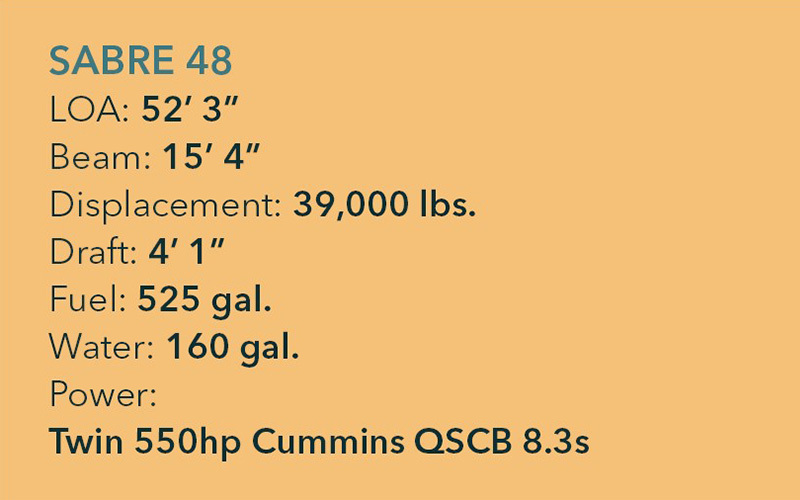 A change of pace for Steve and Dee Olinger, their new Sabre 48 is named DeltaV (literally meaning a change in velocity). Representing much more than the speed boost from life-long sailors to 30+ knot power cruisers, she is a tribute to a difference in lifestyle; honoring the generations of Olingers that have been a part of the Bluewater family since day one. 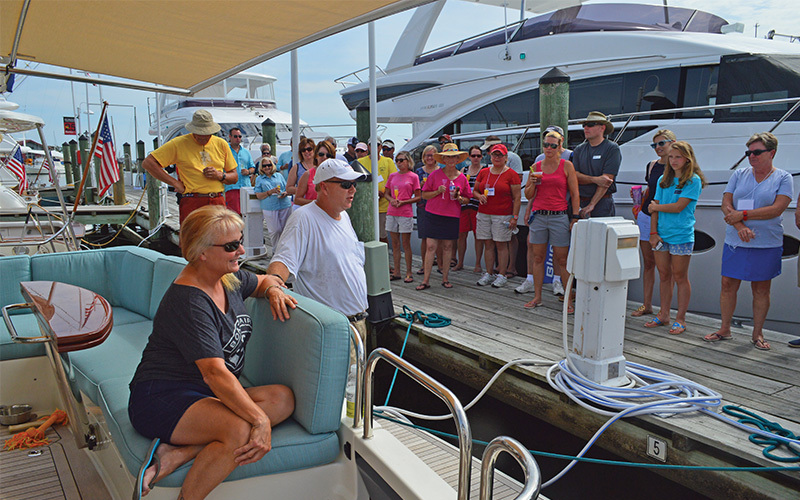 Steve and Dee Olinger both grew up in the Hampton Roads area. Steve started sailing the Chesapeake Bay on their family’s Columbia 26 (one of the early boats sold by Bluewater in the 70s,) and later racing on their Cal 27, while Dee spent time as a mate aboard sport fishing vessels out of Virginia Beach and North Carolina. They always had a passion for life on the water and were looking for a way to give back to his parents while also providing a floating “home” to enjoy more time with their grandchildren in Virginia. The search began with the used boat market, evaluating the brokerage inventory at Bluewater and their network throughout the Southeast. “There were some really great options, but Dee and I decided we might as well build it the way we wanted it,” Steve recalls while discussing the multitude of possibilities for DeltaV. Before final decisions were made, the Olingers leaned on Chris Hall Jr.’s expertise and recommendations for what to do and (possibly more important) what not to do. Bluewater and Sabre joined together with Steve and Dee to create a comfortable environment—from satellite TV and wireless internet to the custom mattress in the owner’s suite and Corian counter tops in the galley. They both agreed, “It was like building a custom house. It was a lot of fun!” Dee, the designer of the family, chose the fabrics and color schemes throughout the interior. They both kept submitting change orders and updates to get it just right. “The Sabre team was so easy to work with and gave our boat a totally custom feel. They even pushed back the helm seat two inches to accommodate my height,” explains Steve. 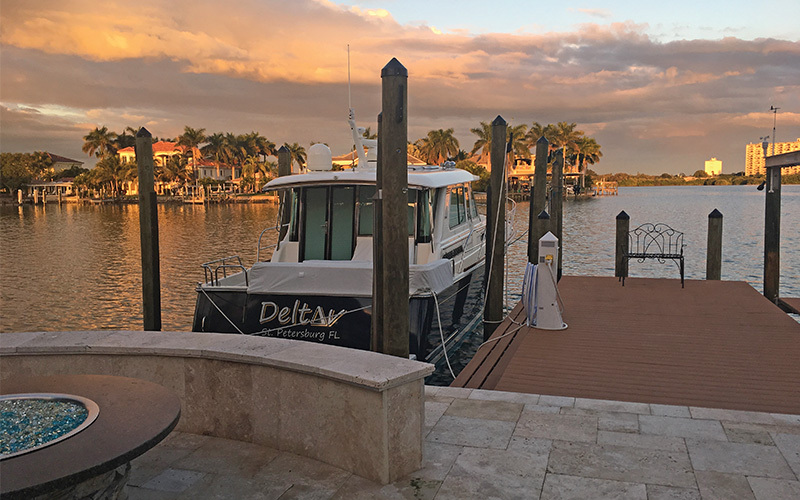 Better than purchasing a vacation home, DeltaV is a “condo that moves” with a bridge clearance of only 16 feet so that the Olingers rarely have to stop when underway. 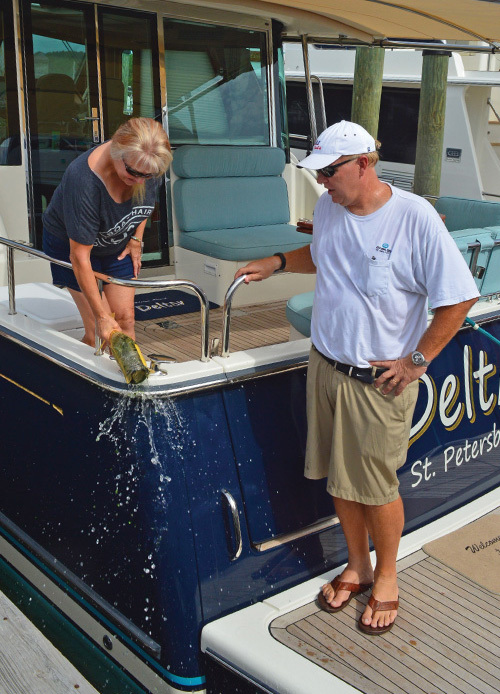 On their last trip down the ICW, Hurricane Matthew had just blown through as Steve and Dee were bringing the boat south, to their home in Saint Petersburg, FL. “The damage from Myrtle Beach all the way to Saint Augustine was apparent, but luckily we only had to worry about the high river levels and a lot of floating debris,” they explained. They decided to spend a few extra nights in Wilmington, NC to wait out the storm; making sure Dee and their dog, Connor, (and of course DeltaV) were safely tucked away before the storm arrived.